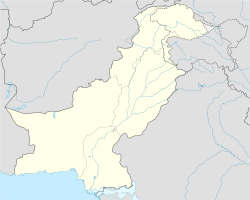 Garhi Habibullah is a town and union council (an administrative subdivision) of Mansehra District in the Khyber-Pakhtunkhwa province of Pakistan. It is located in Mansehra Tehsil and lies to the east of the district capital Mansehra, towards the Kashmir frontier (near to Muzaffarabad the capital of Azad Kashmir). It is in an area affected by the 2005 Kashmir earthquake.